Manufacturer & Exporter of Main Shafts. Our product range also comprises of Valve Trims, Valve Disc and Stellited Components. We feel proud to introduce ourselves as the well-known manufacturers and suppliers of butter fly valve Main Shafts. We are manufacturing the same as per Customer Drg.And material requirements.At present we are manufacturing in special materials like Nitronic 50,Inconel 625/825,Monel400/50,17-4-PH etc.,The offered main shafts are specially manufactured from superior grade raw materials, procured from very trusted vendors in the market. Our supplied main shafts are resistant to damages from water and moisture. We are one of the renowned manufacturer and supplier of Main Shafts that are highly demanded and admired amongst the customers for their sheer quality and precision engineering. Main Shafts are precisely designed as per latest market trends and requirements to ensure the delivery of flawless Main Shafts. Hugh grade metals and alloys are used to manufacture Main Shafts that ensure high strength and anti corrosive properties. 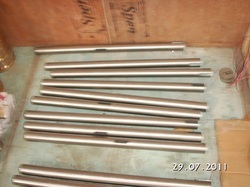 Looking for Main Shafts ?